Blue Zone – become a centurion! “Blue Zones” are regions of the world where people tend to live much longer than average. 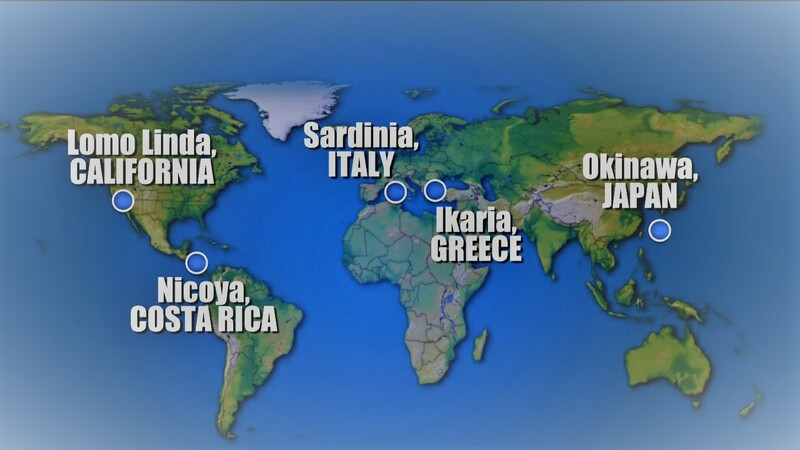 These areas have been identified in countries like Japan, Italy, Costa Rica, US and Greece. Socializing – having friends and family around you is extremely important and beneficial. Food – locally produced, non-GMO, non-pesticide will take you a long way. Exercising/moving – continuous movement/activity is crucial for long term health (that does not mean you must go for extreme exercises or competition but continuous and harmonious movement and activities). There are actually quite a few simple things you too can do to be living like the Blue Zones. I will give you a few tips below. It actually just hit me that we managed to encompass all three of the above now as we are currently visiting a horse farm in Spain where my girlfriend worked twelve years ago! She has kept in contact with this Spanish family for all those years and we were now received with open arms as family. If you stay in contact with old friends, you usually get an invitation and I urge you to go for it. For this particular trip, I knew my girlfriend had an open invitation so I decided to surprise her when arranging it (even in relationships that have lasted for years, you shall always make an effort to nurture it. It doesn’t have to be big things, everything counts so make sure you do something nice every once in a while as it will keep your relationship more fulfilling, happy and enjoyable for both of you. We have now been at this beautiful place for a few days and they have treated us like family. We have been spending time eating their locally produced food, chatting by the fire in the evening and taking long walks during the day. One of the peak moments was probably the complete feeling of freedom and mindfulness I felt when we were out horseback riding on their land. We rode pass cows, chickens, sheep, dogs and even saw the odd dear and it was so peaceful and tranquil. The brilliant thing about spending time with friends is that you can choose when and how often you want to do it. Ideally we should only be referring to friends, with whom you want to spend time, the others you should avoid. Friends should give you energy and enthusiasm, not drain you. If they do the latter, then you should think twice about visiting/inviting them again as it most likely won’t be good for you in the long run. In the end it doesn’t matter where you spend time with your friends, if they are good friends, you will have a brilliant time regardless of where you and they live. Some of the nicest times I have had have been at home at friend’s places and I remember the feeling of pure joy, just by being there in their presence and I know that they felt the same. Regardless of where you are, you can experience the happiness by spending time with the right friends and we all know who they are so make sure you spend more time with them and less (none) with the others. If you can, then add some local food and some activities and you know you can live of those happy memories for quite some time and I am sure that is beneficial for our long-term well-being. The good thing is that we can all do more of the above, either when we are at home by inviting friends and family over and also extend that invitation to friends we have in different cities or even countries. By letting our friends know that they are always welcome to your home, I am sure that most will offer the same friendliness to you and I urge you to accept those invitations even if you might be living different lives, as that only means it will broaden your horizon and understanding of how other people live their lives and I am sure you can learn something from them. So key take-away, when planning you holidays (or even weekends), plan them so that you can visit your friends and family as it has been proven it’s a good foundation for a long life (of course there will always be exceptions). Many of my friends are living in different cities and countries and I try to meet with them as often as I can. With internet access and social media, you can always keep yourself up to date but don’t forget to nurture your relationships with a call or a physical visit. The other advantages of visiting friends in different locations are that you get to know more about their way of living, you get to know the local surroundings, basically you can be a tourist and possibly you’ll have the best guide ever as they know you and what you are interested in and those are the perfect ingredients for a fruitful relationship and a brilliant holiday that hopefully will add value to your life. I have just spent the last twenty minutes writing this little post, while watching my girlfriend who is in the outdoor paddock riding one of these beautiful horses and I can hear and see lots of birds around me and even the odd chicken and dog. As always, I urge you to take action and call an old friend, with whom you have not spoken for a while, invite a friend over or plan a trip to visit a friend you have not seen in a long time (no, I don’t mean tomorrow, I mean now!)!! If you have plans of coming to Stockholm, then do let me know as I would be happy to spend some time with you! What’s the downside, precisely, NONE! If you feel obliged to offer alcohol, offer bio-organic wine but maximum a couple of servings per person! Ask the invited person(s) to meet you at your place a couple of hours before dinner time. Take an extra walk before you head to the local market or farmers market to do the shopping together so that they see all the healthy food you will be sharing with them. When you are walking back to your place to prepare the food, you could take a bit of an extra walk, just to enjoy the company and work up an appetite. Prepare the food together and make sure the TV remote control is far away/hidden (ideally break it… ;)) and turn off your phones, again they are there to enjoy your company and the other way around, don’t forget that! When you are about to part, ask them how they feel in their mind and bodies (surely not tired, not bloated, no sugar cravings shortly after the meal) and suggest you follow up with a hearty walk tomorrow morning as you enjoyed their company so much and it’s so nice to start of the day together with a close friend or relative. I urge you to do that together with your morning rituals (you can find my morning routine here) and I am sure you will be set for another brilliant day! For more ideas on what to eat and cook, head over to our Health Section where you also can find delicious and healthy recipes. If you want to read more on this topic and living like the Blue Zones, have a look at Dan Buettner and his substantial work on this topic. You can also find his book here.